I got this advice from a Forbes editor soon after I began to write for the publication in early 2013. He could have simply said “Focus!” but “slay the same dragon every day” stuck a lot better in my mind. I figure it might stick better in yours, too. What the Forbes editor meant is that the best writers stick to a single topic and dig into that topic each and every day. They are disciplined and don’t get pulled into unrelated fields. When I started to write for Forbes I did NOT slay the same dragon every day, not at first. I created content that was all over the place, depending on what I was interested in on any particular day. One day I told the story of a struggle I had with my business, the next day I analyzed Jay-Z’s new album launch, then I penned something about net neutrality, and a week later I waxed prosaic about the PR industry. I had fun, and people enjoyed my writing (that net neutrality one went crazy and I ended up on national and then international TV) and I received great feedback (except the people who hated my stance on net neutrality), but that was it. The writing wasn’t really doing anything for me or my business, and I wasn’t sure it was worth it to continue with Forbes if it didn’t. I’ll confess I wasn’t entirely clueless. I knew I should have been writing about marketing, seeing as how I ran a marketing agency and had written a book based on 30 interviews with CMOs, but I was afraid I might get in trouble. I was afraid if I talked about marketing I would be seen as self-promotional and might get booted off the Forbes platform. However, after a few months I noticed there were a lot of other marketers on Forbes, who owned agencies, and who wrote about marketing. If they wrote about marketing, why couldn’t I? I decided to test the waters. I wrote an article about marketing. Nothing happened. That is, I didn’t get in trouble. And readers liked the article because, after all, I wrote about something I knew well. Then I wrote another article. As I wrote consistently about marketing, things changed. Slowly at first, and then faster and faster. Then I wrote a marketing article that blew everything up–it was about how to hire an SEO firm. It wasn’t about how to hire my SEO firm, that would definitely have been seen as self-promotional. It was about how everyone needs to hire the right SEO firm for their specific needs, and then I gave four tips on how to do that. The article went to the top of Google for “how to hire an SEO firm” and generated millions of dollars of revenue for my agency, plus tons of attention for me. I went from “that guy who writes interesting stuff sometimes” to “that marketing expert guy who wrote the CMO book and speaks everywhere and hung out with Richard Branson and has a marketing agency with offices around the world and you should hire them.” Yeah, because I focused, I ended up on Branson’s island for a week, sat next to him at breakfast and chatted with him while grabbing Indian food for dinner on his island beach. It was nuts. You are known for what you talk about all the time. Seems like common sense, but it’s a lesson I’ve had to learn over and over, despite the fact that every time I follow that common sense, I get amazing results, and every time I ignore it, I fail miserably. I did the same thing on LinkedIn for years. I wrote about what was interesting to me instead of focusing. Then I started to write about how to successfully build a personal brand on LinkedIn through thought leadership, and built a 6-figure business on it. Hmm, should have focused sooner. 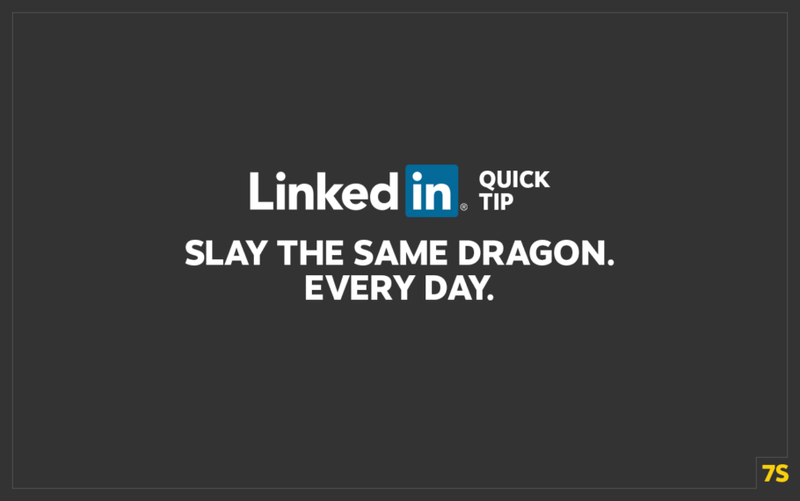 Don’t do what I’ve done–go out and slay that same dragon every day on LinkedIn, and don’t get distracted by all the shiny stuff.